If not, go to the local library and check it out. Even better, go to the bookstore and buy it, since proceeds support the organization that the author started – Next Generation Nepal. I'm all about the library, but in this case, it's worth a purchase. 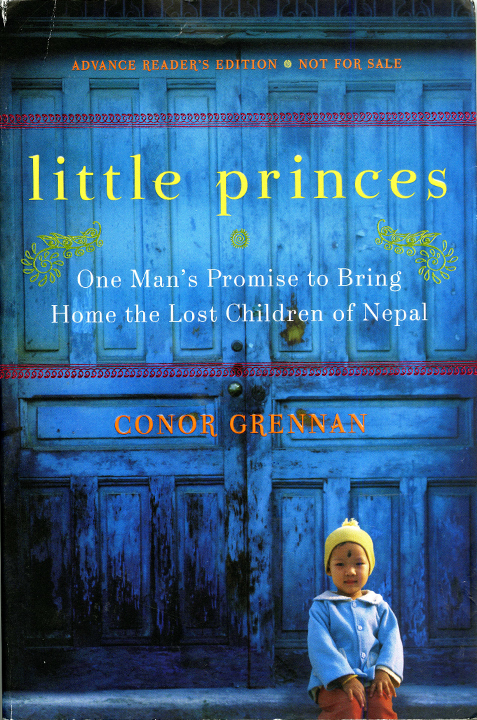 Little Princes made me want to laugh, cry, run to Nepal to save children, and throw my hands up in the air in triumph, sometimes within the same page. I’m a deep believer in fate. Signs are all around if we just stop to look for them. We’re in the hands of the universe, and things happen for a reason. I know some skeptics are rolling their eyes right now, and maybe it’s all a random coincidence, but so often I get this feeling that things come into my life just when they’re needed. Sometimes it’s finding a new friend when I’m feeling especially lonely, or a big break when I’m about to give up, but usually it’s the little things - as simple as coming across a good book. This non-profit idea had been stewing in my brain for months, details floating in and out, and I was in the midst of major research. About a month ago, I had almost given up on the idea entirely. After reading through pages and pages of advice on how to file for tax-exempt status with the IRS, the complications of the paperwork, the need for a lawyer, the difficulties of fundraising, I felt like throwing in the towel. How could I, little old me, ever found a non-profit organization? Then I began to feel like my work would be meaningless. How could our little organization help the millions of people in this world who are in destitute conditions? At my nadir, I happened to come across Little Princes, fell in love with it, was inspired, and all my negativity turned back into hope. Above all, this is a story about how a couple of people giving a little can make such a difference. And it made me realize that our group doesn’t have to barge over to the Philippines, and make everyone’s lives better with a million dollar budget. We have to focus on one tiny goal at a time. This book touched me in so many different ways. The story itself is impossible to resist - that of a young American guy who sets off on a world adventure, only to find himself drawn back to an orphanage in Nepal where he began his adventure. It details how he establishes a non-profit to reunite trafficked children with their families, and how well he succeeds. It’s a love story. The universal themes are written so that anyone can feel them through the pages. But, I believe it also touched me because I could see so many similarities between the children described and "our" kids in the Philippines. Poor, but incredibly resilient and happy all the same. I also think this book touched me because I’ve been to Nepal and seen what happens to a country when its government completely abandons it. What happens to a country when the well-being of the people is shamelessly and openly replaced with corruption and greed. Nepal is a case study in “what could have been”. The landscape is beautiful and mountainous, but what should be pristine streams have turned into a brown sludge, filled with garbage and waste, winding its way through cities and country, leaving disease in its path. The basic infrastructures like running water, electricity, security are all lacking in daily life. The saddest part is that the country has the resources to provide these things to its citizens, but the government is too busy making money for itself to give anything else to the people. Line of women waiting hours to get a little water for their houses. Water is so scarce, whatever is around is used for everything. Chobhar - Trash and waste line what's left of the water that isn't being diverted for electricity to be sold to other countries. 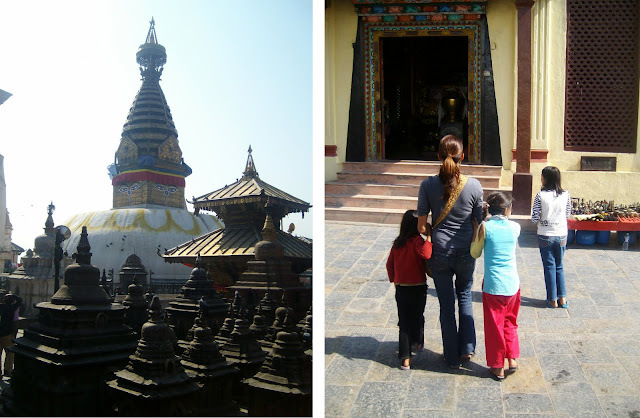 On our second day in the Kathmandu Valley, we decided to make the trek up to a highly sacred temple for both Buddhists and Hindus, Swayambhunath, which is a couple of kilometers from the center of Kathmandu. The temple is more fondly referred to as the Monkey Temple, as the temple grounds double as a playground for (according to legend) sacred monkeys. The monkeys certainly acted as if they were holy, as they slid down the banisters, jumped from tree to tree around the complex, and came close enough to us to reach out and touch, only to give us a strangely human raise of the eyebrows as they jumped back into the trees and temples. Swayambhunath was situated on a steep hill, and the only way to get up to it was to climb a large, daunting set of stairs that seemed to have no end, from our position at the bottom. After I finished squealing to myself about how cute the monkeys were, I got to the more serious task of climbing up all those steps. In the polluted morning air, we slowly climbed the staircase, pausing every so often to take a look around, to observe some playing monkeys or to take a picture. About halfway up to the temple, a group of three girls started trailing us, leaning in close enough to give us shy smiles, and then backing away giggling for a couple of seconds, and coming up close again. By the time we reached the top of the hill, the girls had joined our group, the shy smiles becoming big grins as they were encouraged by our own friendly looks. The girls eagerly became our unofficial tour guides. Each girl took hold of my hand or arm and we walked around the temple complex like some 8 legged awkward creature. They pointed out various interesting parts of the temple and Sergio followed behind, snapping away with his camera, catching every moment possible. I was charmed by them. We could only communicate with the little bit of English that they knew and an elaborate system of hand gestures, but we spent a deeply pleasant hour walking around the temple soaking up the holiness. From what we could gather, they were between the ages of 7-10, and had the day off from school because of either a religious holiday or a strike, both equally likely. The main stupa of the Monkey Temple is breathtaking, The most striking things about it are the sets of eyes painted on all four sides, pointing in each cardinal direction. Supposedly the eyes of Buddha, they gave the stupa a strange feeling of being alive, as if they were able to see everyone and everything. Two pairs of eyes were for communication with the gods. The other two sets of eyes were said to represent wisdom and compassion, feelings that would come in handy for me later in the day. After a couple of hours at the Monkey Temple, we began our walk back down to Kathmandu, and our new friends stuck with us. Both Sergio and I were in really great moods: calm, spiritual, and charmed by the innocence of the girls, tagging along for a day. My first instinct had been to be cautious, I was sure the girls were going to ask for something, or reveal some scam they were running for an adult, but they had patiently hung out with us for hours without asking for anything, seemingly happy to just be with us. It began once we got back out into the street away from the temple complex. A quiet voice at first from the most outgoing of the girls – “We so thirsty.” Cough cough, “drink.” Encouraged by the first girl, the other joined in “thirsty. Hot day. Drink.” It was an innocent enough statement, and we bought them a bottle of water and then kept walking. Soon we heard more requests, “food. Hungry.” All of a sudden, my calm mood was burst. Of course, once again, we were being asked for more than what we “could” give at the time. Suddenly I was sure these innocent girls were about to ask us for something else, or lead us to some scam set up for tourists. I realize now that my annoyance was probably a reaction stemming from guilt at not being able to help them more. A sort of defense mechanism to deal with feeling the responsibility. But at the time, I couldn’t see things so clearly, and I was mad at them. Being asked day in and day out, all day for things, feeling like people always were out to take advantage of us, expecting more from us, became unbearable at times. I felt everyone’s expectations weighing on us, and some days, I just wanted to shout, “We are just two budget backpackers!! Go ask someone else! !” How quickly I became cynical, bitter even. I settled into my bad mood. The sun was beating down on us, the midday traffic of the Kathmandu streets was kicking up dust and pollution, limiting my lung capacity, and once again we had been “tricked” into feeling that there was no ulterior motive - just three young girls curious about us. Then, suddenly, Buddha’s eyes from earlier popped back into my head; particularly those that convey wisdom and compassion. I had a big change of heart and snapped out of the crazy mood I was in. I realized that if, for example, my parents took me out to dinner, I would want them to pay for me. If I got invited out for a day trip with a wealthy couple that I knew had tons of money, they would buy my ticket. What was I thinking, getting mad at these girls? I believe it was the eyes of compassion that made me stop and analyze my reaction. But in any case, we stopped to buy them some more water and cookies and had a snack in the street. I was even more ashamed when the girls offered us some of the cookies we had given them, and tried to give the unfinished pack to us. We insisted they keep them, said our good-byes and kept on walking. The girls looked wistfully after us, as they wanted to stay with us, but stated they “weren’t allowed” to cross the bridge back into Kathmandu. Maybe all those people who were constantly asking us for things didn’t see Western travelers as “walking ATM’s” as I heard some jaded travelers complain about while describing their experiences. Maybe they’re not all natives out to dupe tourists for everything they can get. Maybe they’re just people who see others that have been dealt a much better hand than they have, and hope for an opportunity. A chance at something that they don’t have the resources to achieve on their own; a chance, for a day, or an hour, a minute, or simply while finishing off that bottle of water, to be something and somewhere different. It’s easy to become cynical when people are constantly asking for something, or when we live a life of comfort, but sometimes, all it takes is a little perspective to see things as they are. When I see a chance in my life, I grab it, and perhaps that’s simply what all the people we encountered were doing - reaching for an opportunity that happened to be in the form of two happy backpackers. With this non-profit, we hope to be instrumental in creating that opportunity that people can reach for. In some cases it will be a gesture as small as providing a bottle of water and a couple of packages of cookies, but we hope that in the future, this will grow to create opportunities through long-lasting changes that can provide much, MUCH more than that.